Newcomb; Elizabeth M. Fennessy, went to heaven to meet the love of her life, George on Valintines Day, Sunday February 14, 2016 at the Adirondack Medical Center Hospital in Saranac Lake, NY. 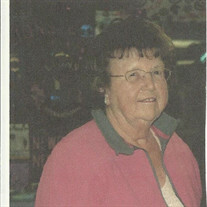 Betty was born February 2, 1929 in Newcomb, NY the daughter of the late John L. and Mildred Wolcott Anderson. Betty was predeceased by her husband of 61 years George Fennessy Jan. 21, 2014 and her brother Jack Anderson. Betty graduated from Newcomb Central School in 1947 and went to St. Vincent's School of Nursing in New York City and graduated in 1950. She began work at Sunmount VA Hospital in Tupper Lake, where she remained for 39 years. She married her husband George in 1952. Betty was a communicant of St. Therese Catholic Church, she enjoyed rowing boats and fishing with her husband, reading magazines and books, knitting and fashion. She also enjoyed wearing her bracelets, swimming and tanning every summer and when she could walk, walking her beagles and walking into Santanoni every day. Left to cherish her memory is her daughter, Lana, her sister Margaret (Kenneth) Bell; two nieces and five nephews. A Mass of Christian Burial will be celebrated Friday Feb. 19, 2016 at 11:00 AM at St. Therese Catholic Church in Newcomb, NY, by the Rev. Peter Berg pastor. Interment will take place in St Therese Cemetery at a later date. At Betty's request there will be no calling hours. The family requests memorials take the form of donations to the Newcomb Rescue Squad, Newcomb, NY 12852. Funeral arrangements are under the direction of the Edward L. Kelly Funeral Home.